It’s awesome to see urban wood receiving positive media attention. Wisconsin Urban Wood and the urban wood movement at large recently received an excellent plug from WEAU TV of Eau Claire, WI. 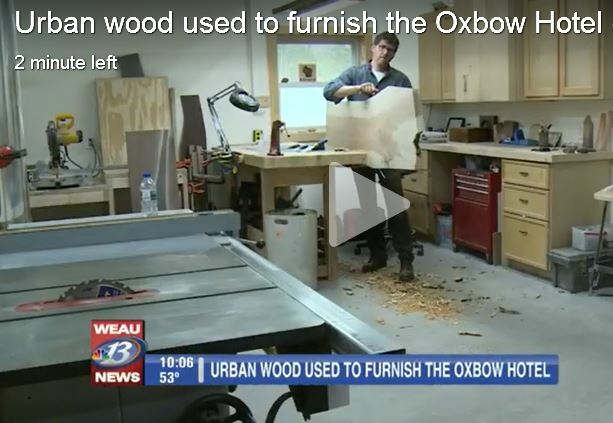 The TV station ran a profile of current efforts to refurbish the Oxbow Hotel in the city’s downtown with more than 150 furniture items crafted from recycled urban wood. The list of products includes 30 headboards, bar stools, restaurant table and more. Leading the charge is Tim Brudnicki, owner of Eau Claire Woodworks. Brudnicki, a multi-award winning furniture designer/fabricator, is a member of Wisconsin Urban Wood, a non-profit group that has forged a network of woodworkers, sawyers and tree care specialists to repurpose trees lost to disease, storm damage, etc. into valuable lumber and wood products. The majority of wood being used in the Oxbow Hotel project comes from City of Eau Claire ash trees subject to infestation by the deadly emerald ash borer. WEAU’s short video report is definitely worth checking out. Great, I appreciate your effort in making the urban wood to be attracted by media thereby the world toward. I’m not in US, but following you from another end of the world (East Africa) because of my profession wood science and technology. The name wood science and technology these days is in process of dying from my point of view. But, you are struggling to show to the world importance of that through urban-wood. Thank you for that and feel free to contact me in case if my input is important for you. To give you some information about my background, I’m PhD holder in wood utilization and taught wood science and technology for more than 10 years at university level and currently working as a researcher for promotion of wood industries at one of the largest forest based enterprises of my country. Thank you! Thanks, professor. It’s very interesting to hear your take on urban wood, especially coming from your vantage point as an expert on wood science from East Africa! Are you aware of any companies promoting the use of logs salvaged from community and landscape trees for lumber and wood products?